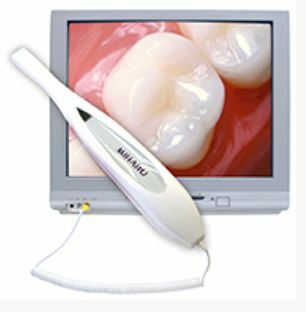 An intraoral camera gives the patient a view of what the dentist sees. This is an important dental tool that allows our dentists, Dr. Zeiger and Dr. Frausto to better communicate with their patients, showing them potential hazards and restorative work that is necessary. Our team at Bradshaw dental want to assist our patients in maintaining a healthy mouth. Our best way to do this is to educate, demonstrate, and create an active working relationship between you, our dentists and your teeth. An intraoral camera is able to capture images, and share them on a screen near your chair, and is able to air a live stream of video as our dentist shows and discusses necessary work. Patients have found that they appreciate this tool and being part of the process of their dental care. Will an intraoral camera hurt? No, the intraoral camera causes no pain or discomfort. This tool is about the size of a toothbrush, allowing it to fit comfortable in your mouth. Resembling a wand, an intraoral camera is not hot or cold, causes no vibration, and is not oversized in your mouth as some other dental tools may sometimes seem. It allows Dr. Zeiger and Dr. Frausto to show images or video from every angle, allowing patients to see the entire tooth, even if it is placed far back in their mouth. What can you see using an intraoral camera? The largest benefit of this tool is communication. Sometimes patients express fear of what they can’t see or feel. We want our patients to understand and be part of the process. We hope to answer our patients questions and help them feel more comfortable. An intraoral camera is both a fantastic diagnostic tool and a great educational aid. Another benefit of the intraoral camera is the ability to save images. We can use the images taken to review future work in comparison. We can send images to specialists or to other dentists at your request. We can send images to an insurance company who is disputing work that was done. These images are saved in a high resolution in a file in our computer. They will never be lost, never mistakenly under another name, and will always be instantly available. A great benefit to intraoral cameras and its software is that it allows us to print out images for patients to take home. This allows patients to discuss treatment with their partners, and consider the proposed treatment plan. We want our patients to feel comfortable and to hopefully become motivated to improve their oral health. Can other areas be examined as well besides my teeth? Yes! An intraoral camera is not just for teeth but for the entire oral cavity. With clear, high definition images, we can examine the soft tissues and surrounding cavity of your mouth. We are able to spot precautionary symptoms that may indicate other health risks. We can examine lesions or cysts, damages from eating disorders, and possible signs of disease including the health of your gums. Our images help us explain the diagnosis to patients and how to proceed with treatment. What’s more, we can explain to your insurance providers and other members of your healthcare team including medical doctors what consequences may come to a patient if the condition is left untreated.